Domino's Pizza has revealed what it describes as "excellent" results for last year, driven primarily by the growth in its digital sales. The company also says its franchisees were helped by a "record low cheese price, favourable wheat price and a fall in fuel costs". Pre-tax profits were £73.16m, up from £62.1m in 2014. E-commerce sales now account for 77.7% of all UK deliveries and 48.6% of online sales are made using its app. Domino's says online orders in the UK rose by nearly 29% last year and app-based orders shot up by more than 41%, with 11.5 million people now having downloaded the app in total. "The thing that customers want more than anything else is convenience and that means food that's delivered to their home," chief executive David Wild told the BBC. The second most important thing, he said, was food that can be ordered online. "We have seen a massive increase in our online orders - a total of 11.5 million app downloads since we launched our app two or three years ago - and what we have learnt is that customers like to find it easy to get hold of a pizza and that's the most important trend," Mr Wild said. The chain opened a record 61 new stores in the UK in 2015, taking its total number of outlets to 869 by the end of the year. 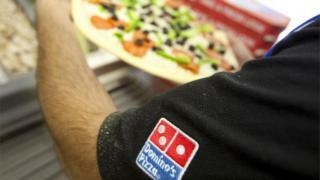 Domino's said its franchises had seen increased profitability over the course of the year "primarily as a result of the benign food price environment combined with the group's purchasing power". "In 2015 we passed on savings of £11m from lower food costs primarily from cheese and dough and the outlook remains favourable for 2016." Apart from the UK business, Domino's Pizza Group also owns the franchises in the Republic of Ireland, where it has 47 stores, and Switzerland where it has 15, as well as Liechtenstein and Luxembourg. Last December, it entered into a joint venture to buy Germany's biggest delivery chain, Joey's Pizza. That deal was finalised at the beginning of last month and as a result Domino's Pizza Group is no longer directly operating in Germany. In the UK, Domino's featured in a Channel 4 documentary called "A Slice of Life" which was viewed more than a million times and which it said, resulted in a significant increase in recruitment applications. During the year Domino's launched the Tikka Pizza and reintroduced the hot dog stuffed crust pizza. In the first nine weeks of trading in 2016, UK like-for-like sales grew by 10.5%, in Ireland they were up 13.7% and in Switzerland 4.3%. "Momentum continues with a good start to 2016 despite increasingly tough comparatives through the rest of the year," Domino's said.